Providing safer, reliable power, through proper vegetation management that allows us to coexist in our urban forest. Cowlitz PUD has been providing safe, affordable and reliable power to the residents of Cowlitz County for over 80 years. A key component of that reliability has been our vegetation management program. 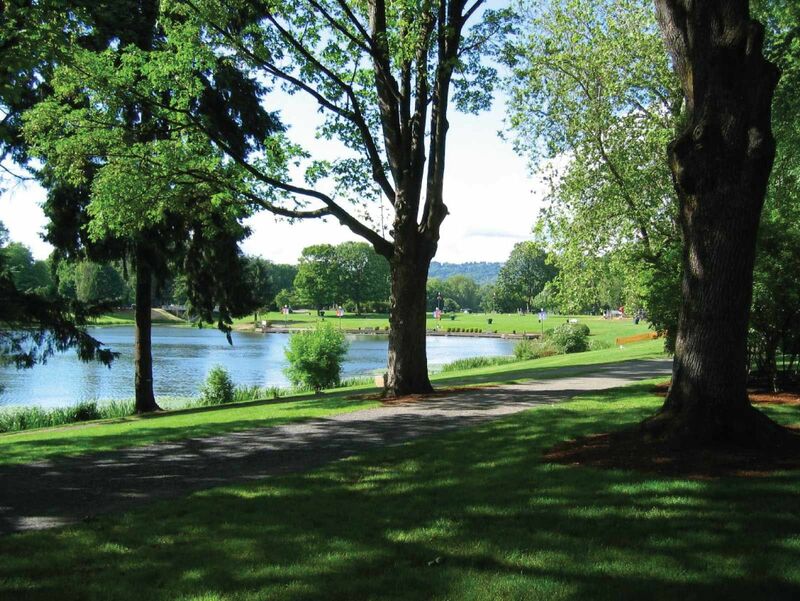 We believe that trees are an important part of what makes Cowlitz County a beautiful place to live. We take a proactive approach to vegetation management near our power lines and electrical facilities. But we cannot be everywhere at once. That is why we believe that our customers are an important part in our ability to address problems that may pose a threat to our power supply system. Customer input, combined with regularly scheduled right-of-way maintenance, help to ensure that our power system is as reliable as possible. Trees contacting the power lines are the leading cause of power outages on our system. That is why we do everything we can to find a healthy balance between our appreciation for trees, and our obligation to provide safe and reliable electric service. Through our regularly scheduled tree- trimming program, we redirect tree growth away from power lines to help limit damage that may occur due to extreme weather (see Fig. 1). Fig. 1 Tree trimming examples, topping used only as last resort. Cowlitz PUD spends approximately $1.4 million a year on its vegetation management program. Our licensed and bonded contractors are professionals at right-of-way maintenance. They clear and trim all trees that are within 10 feet of overhead power lines to help ensure the reliability of our electrical system. The ultimate goal of our right-of-way maintenance program is shown in Figure 2. Figure 2 Preferred right-of-way clearances. We realize that this is not always possible due to existing vegetation, and is why we work together with our customers to get as close to the ideal trim as we can. There are times when trees outside of the right-of-way pose a threat to electrical service. In the case of these “danger trees”, we will contact the customer so that we can work together to remove them. That is also why we need your help in identifying potential danger trees and right-of-way issues. With over 119 miles of transmission lines, and 622 miles of distribution lines, we cannot always see when potential danger presents itself. That is why we ask that if you see a tree or vegetation encroaching upon, or posing a threat to our facilities and right of way, to please fill out a Tree Trimming Request/Trouble Ticket. There you will be asked a few questions, and be able to attach a photo, that will help us to assess the situation and respond accordingly. You may also contact Cowlitz County PUD at 360-423-2210 and ask to be directed to the Vegetation Management Department. If you are planning to do some landscaping, or even plant a tree, we ask that you keep some things in mind. Trees and shrubs can be a problem for overhead and underground facilities. Look up to see if there are overhead lines above or near your planting site. Look around to see if there are green metal or fiberglass boxes that shouldn’t be planted near. For more information on where to plant the right tree so that it’s in the right place, go to The Right Tree Book (PDF) link where you’ll find out more information on the best species of trees to plant near overhead power lines, and how to plan your landscaping around our underground facilities. Crew working Location: You will be able to see when tree trimming crews are working in your area. Remember, they will be working on roads and streets throughout the county. So please drive slowly when passing through their work zone. Free Wood Chips Drop Site Indication: By filling out our Tree Trim/Trouble Ticket form, you may request to have a load of wood chips dropped off at your residence when crews are in your area. The map will then pin your location after your request has been processed, and it has been updated. You will then be able to see when crews are in your area and call to schedule a chip drop. Tree Trim/Trouble Tickets: Once your Tree Trim/Trouble Ticket form has been processed, an icon will show on the map indicating its status. This will show you that we are aware of the issue, and when we plan on addressing it. Why do you prune trees from power lines? Safety – Trees directly touching power lines can put stress on live wires and cause branches to burn and fall to the ground, sometimes causing fires in trees or nearby buildings. Trees growing close to power lines are dangerous because they create a potential path for electricity to travel to the ground. People that come into contact with this path (by touching, climbing, trimming, or cutting down the trees) put themselves at serious risk of being electrocuted or receiving significant electrical burns. Storm-related outages – Wind, snow, and ice often damage trees. Branches, limbs and entire trees can fall on power lines resulting in power outages that can last for days. Voltage loss – Trees touching power lines drain electricity off the electrical system resulting in voltage loss. Low voltage can damage motor-driven appliances in homes, such as refrigerators or washing machines, and sensitive electronics such as computers. What companies do you contract with to do tree trimming? Why do you need to prune so much of the tree? Can you shape trees for a better look? Our primary goal is to deliver safe and reliable electric service to our customers. In order to accomplish this, we need to maintain a safe distance between trees and power lines. The minimum clearance for most power lines is 10 feet. We employ a team of tree experts to ensure that proper pruning techniques are used to keep your tree alive, healthy, and out of harm’s way. Although the initial prune with the directional pruning technique may appear severe, this method is recommended over topping or rounding-over trees. Directional-pruned trees are less susceptible to disease and insect problems, and the overall structure of the tree is stronger, more resistant to high winds and heavy ice. Directional pruning removes only those branches that pose a threat to power lines. Future growth is directed away from the power lines. Why don’t you prune less off the tree and come back more often? Wouldn’t this resolve the problem of badly shaped trees and trees in the lines? With over 622 miles over head of distribution power lines and over119 miles of transmission lines feeding over 48,000 customers, to keep the cost of power low to our customers, trees are pruned on a 3-year pruning cycle. My trees aren’t touching the lines, so why do you have to prune them? We consider several factors when determining whether to prune a tree. Will strong winds cause the tree to make contact with the wires? Will movement in the wires, such as sagging due to high temperatures, cause the wires to contact the tree? Will wet rainy weather cause branches to droop? Your trees may not be touching the wires now, but they may before the next pruning cycle. We plan ahead for potential problems. Do you prune trees from the wire that runs from the pole to my house? We prunes trees located between poles and the first 10 feet from where they attach to utility poles or service bridles. Maintaining clearance after the first 10 feet is the property owner’s responsibility. This is not a high-voltage line, however, we recommend that you hire a professional service to do the pruning. Cowlitz PUD will provide a courtesy disconnect so that this work can be done safely. Please call our Engineering Dept. at 360-501-9546 to schedule an appointment to have your service disconnected so that you can perform this work safely. When do you remove trees? If a tree poses a hazard to safety and property, or if pruning will undermine the health and overall stability of the tree, we work with the property owner to remove it. Unless there is an emergency, we will contact you in person or in writing before removing a tree from your property. Trees in the lines wouldn’t be a problem if you had underground lines. Why don’t you put all your lines underground? There are a number of obstacles to placing all power lines underground. Existing trees and their root systems would be impacted, undermining the health and stability of the trees. Considerable expense, time, and disruption would be involved in trenching through existing road systems and landscapes. The cost of designing, engineering, and installing an underground system in an established neighborhood is very high. Customers would have to pay for an underground system.In general, maintenance, repair, and rebuilding underground systems are more complex and expensive because the lines and structures are buried and hidden from view and not easily accessible. Do you remove the debris after you prune? Normally our crews remove tree limbs and the debris created. In the case of tree removal, we will all material possible. The logs are left by the right-of-way for the customer to remove, or in some cases are left for the public if the customer does not want them. When tree debris is caused by a severe storm we are not always able to remove it. In these situations, crews cut broken and uprooted trees so they can access the damaged area to make repairs. Brush and wood may be left at the site so that they can proceed with other restoration work. I hired a tree company to prune/remove my tree and they say they can’t because it’s too close to the lines – what do I do now? Only Qualified Line Clearance Tree Trimmers may work in proximity of our distribution or transmission power lines. If you want to have a tree that is too close to power lines removed or pruned we will perform a “make ready” at no charge to you, assuming all necessary permits are in place. This means we will remove as much of the tree as necessary to eliminate the potential electrical hazard to a non-Qualified Line Clearance Tree Trimmer, making the tree “ready” for removal or pruning. As with all other work, Cowlitz PUD will remove all brush leaving burnable firewood on site. Can I prune my own trees? State and federal safety regulations require that anyone working within 10 feet of a high-voltage electrical line must have proper training and certification. Most private tree companies do not meet this requirement. Before these companies can prune or remove trees, Cowlitz PUD must first prune the trees to minimize or eliminate the risk of branches falling into the lines. This is for your safety.The power lines that run from pole-to-pole carry high-voltage electricity. Each year, a number of amateur tree pruners are seriously injured or killed when they come into contact with an energized line directly or indirectly through tools or tree limbs. Poles, ladders and elevated lifts can easily provide a dangerous electrical path if they make contact with an energized line. By pruning your own trees, you may be putting yourself in a dangerous position. We recommend that you hire a professional service and that you check with Cowlitz PUD before beginning. Do you have information about the right trees and shrubs to plant under the lines? Please do not plant vines, shrubs or trees directly adjacent to or on power poles or guy wires. Keep all vegetation at least 10 feet away from poles. Our crews must have quick access to climb poles when making repairs.Depending on the species, young trees mature to different heights. When you select new trees, anticipate the height and spread of the mature tree in relation to power lines. Smaller trees will remain healthier and look more natural without pruning. They will enhance your neighborhood environment while supporting a safe, reliable electrical service. Cowlitz PUD promotes the right tree in the right place. We offer a free publication, The Right Tree Book, with information on selecting and planting appropriate trees and shrubs around utility lines. A free copy can be obtained from our Main Office reception located at 961 12th Ave. Longview, or you may print out a copy located insert link here. How do I request wood chips? You can request wood chips from Tree Trim/Trouble Ticket form. We will then contact you when we have crews in your area to schedule a time and place to drop the chips. Can customers request that Cowlitz PUD prune trees? Yes, if you notice an urgent hazard such as a broken tree limb on a pole-to-pole power line or trees in the lines with arcing and sparking, please call 360-423-2210 and stay on the line to be connected to our System Operator, or a customer service representative. To report non-emergency issues with trees in power lines you can submit a tree trouble ticket through the following link Tree Trim/Trouble Ticket form . There you can also attach a photo to help us better asses the issue so that we may respond with the appropriate personnel. You can also call 360-501-9518, Monday-Friday between 7:00am and 3:30pm. Under what circumstances can you enter my yard and prune my trees? As an electrical utility, we are responsible for maintaining our system and to protect the health, safety and general welfare of the public. Customers must allow access to their property at Tree Trim/Trouble Ticket form reasonable hours to inspect, maintain, and repair the electrical system. We will attempt to notify our customers before we access their property. Who do I contact if I have tree pruning questions or issues? Call 360-501-9518 or 360-423-2210, you may also submit our online tree trimming form at Tree Trim/Trouble Ticket form. A Cowlitz PUD employee will respond to your questions or concerns, usually within two working days. What is the difference between transmission and distribution power lines? Transmission lines carry higher voltages over longer distances. Our transmission lines carry 115kV and 230kV. Our Distribution system carries lower voltages shorter distances. Our distribution lines are 12.5kV.